RMFSC is committed to creating a safe and positive environment for members’ physical, emotional and social development, and to ensuring that it promotes an environment free of misconduct. RMFSC supports and fully participates in U.S. 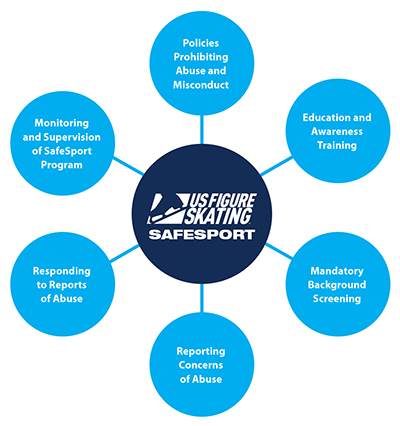 Figure Skating’s SafeSport Program. 1. Go to www.safesport.org. On the top right will be the words: “SafeSport Training: New User/Existing User.” If you already have a Team USA account, you can sign in with your existing account information. If not, click on New User and create an account. 2. Once you have signed in, you are taken to the training page. Click on the icon labeled “Store.” The list of all available training videos will appear. 3. Click on “SafeSport Parent,” then “Add to bag,” then “Checkout,” then “Activate.” The video is then ready for you to view at your convenience. While this seems like a purchasing process, there is NO charge for any of the training videos. 4. In the future, when you sign into your account, you will be taken to a dashboard that will show the training course or courses you are currently viewing and the completion percentage of each. 5. If you have any questions, feel free to contact our SafeSport Compliance Chair or any other board member.